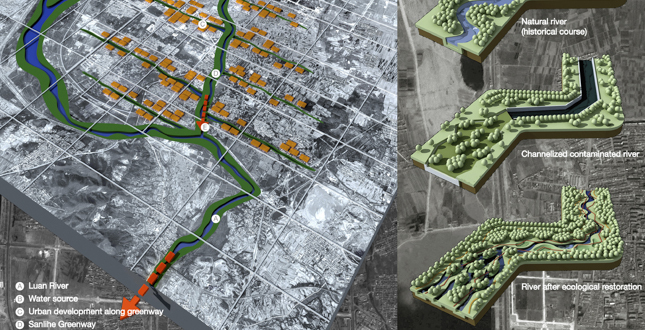 3D model of the Greenway and its transforming process: making use of different altitudes between the Luan River bed and the city, the project creates a water-centered public space integrating stormwater management, habitat restoration, recreation and art, and catalysts urban development. Key map shows locations of selected images in this presentation. 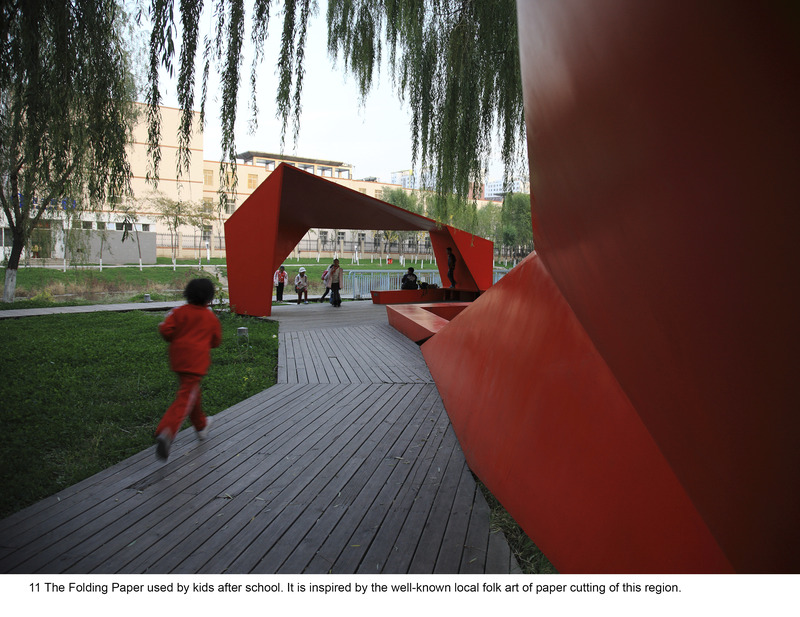 Art is integrated into this ecologically recovered landscape: an 800-meter long Folding Paper corridor inspired by the well-known paper cutting folk art in the region, running through the middle section of the project. Image shows site condition in 2006. 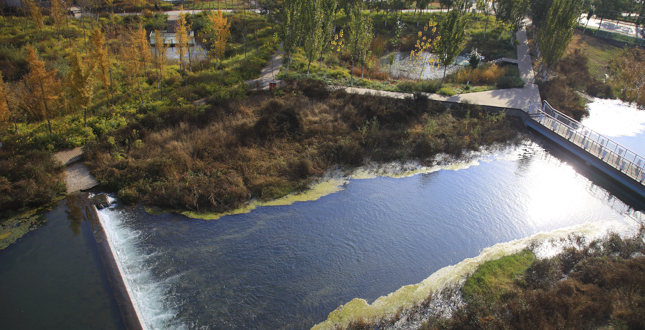 This project transformed the former garbage dump and sewage drainage into an ecological infrastructure and everyday landscape. 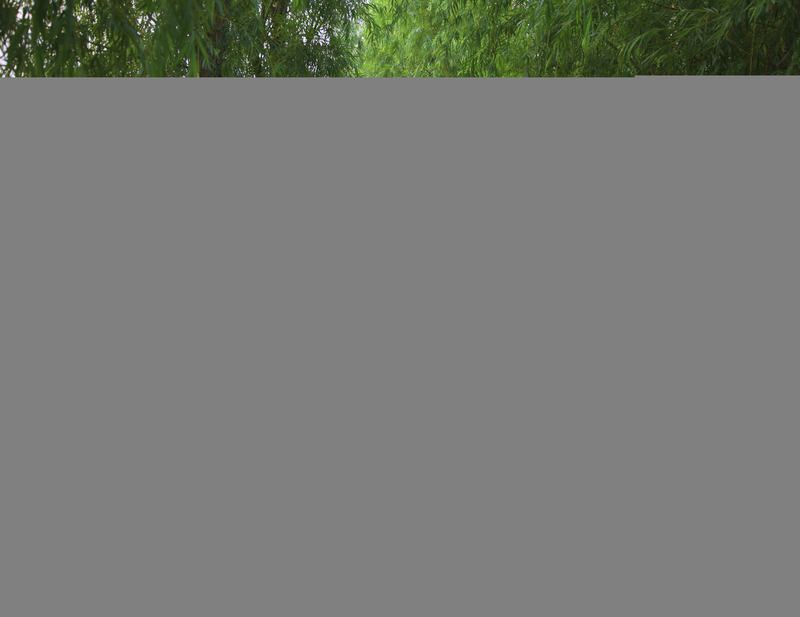 A typical image of the upper section of the Greenway, featuring a newly created and lushly vegetated stream that diverts water from the Luan River, with pedestrian and cycling paths on both sides. Resilient green river strategy: the existing concrete channel of the river was removed, and bio-swales at the edge of the main water course are constructed to regulate floods and remediate urban stormwater runoff, acting as “green sponge” and creating diverse wildlife habitats. The middle section of the Greenway runs through the densely populated communities, featuring the 800-meters long Folding Paper. 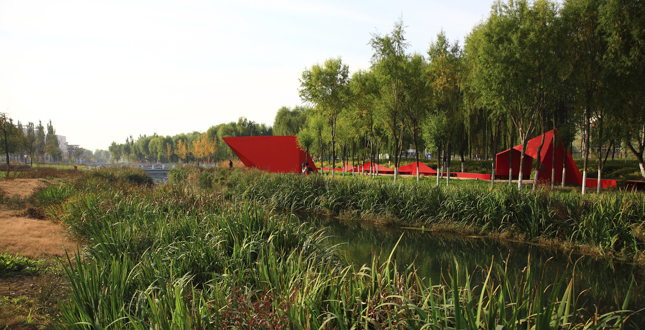 The Chinese-red art piece is made of fiberglass that zigzagging through the green canopy of the pre-existing willows along the former river channel. 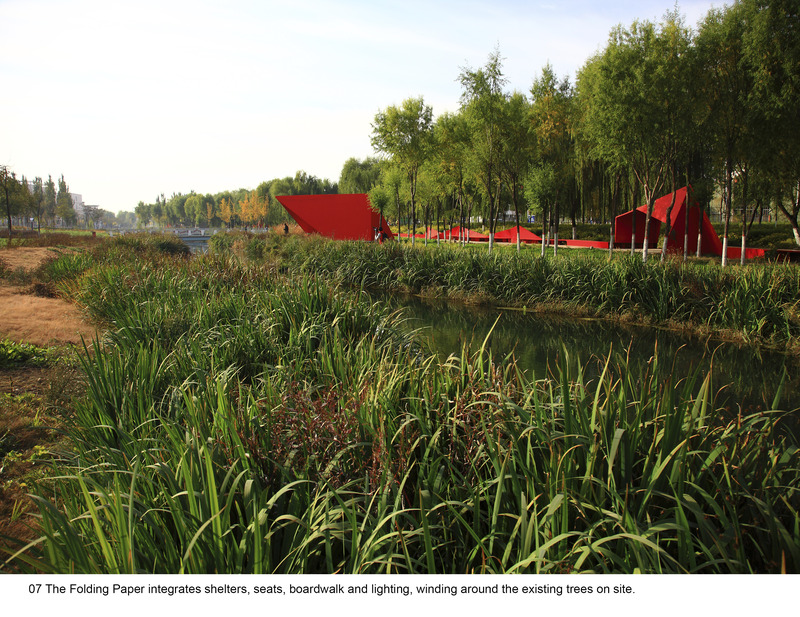 The Folding Paper integrates shelters, seats, boardwalk and lighting, winding around the existing trees on site. 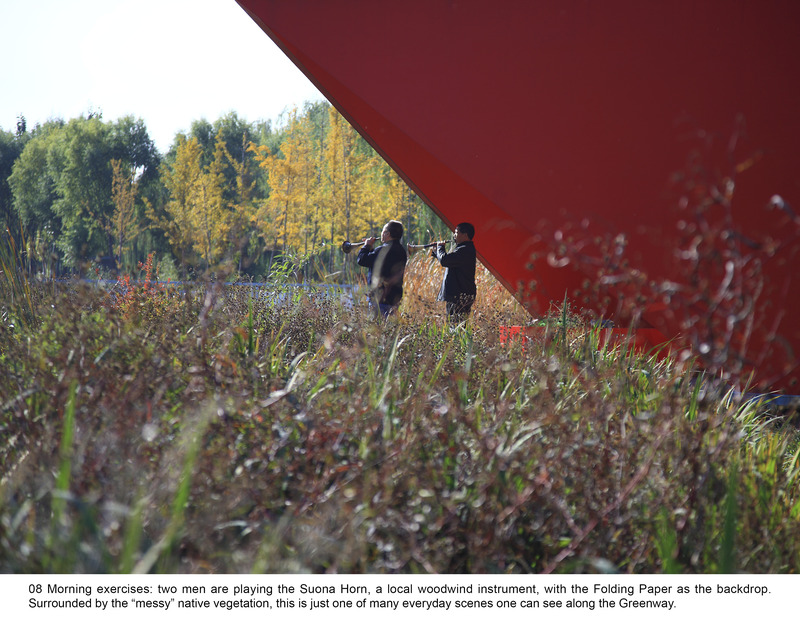 Morning exercises: two men are playing the Suona Horn, a local woodwind instrument, with the Folding Paper as the backdrop. Surrounded by the “messy” native vegetation, this is just one of many everyday scenes one can see along the Greenway. 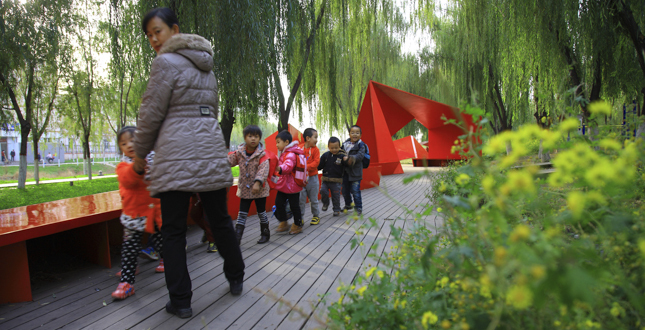 As a linkage between the densely populated communities on north, and an elementary school and a kindergarten on south, the Folding Paper creates playful experience for youths and their parents: a kindergarten teacher and kids are wandering on the boardwalk intertwined with the Folding Paper. 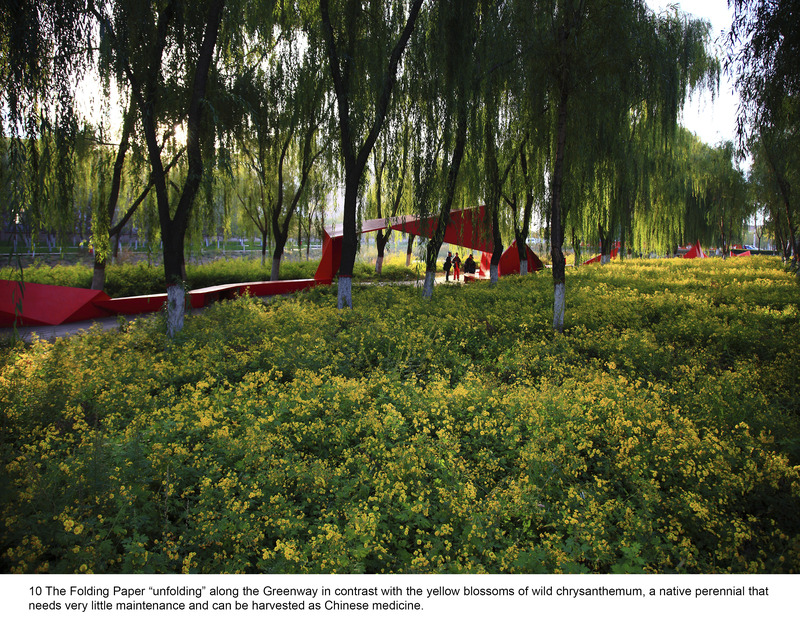 The Folding Paper “unfolding” along the Greenway in contrast with the yellow blossoms of wild chrysanthemum, a native perennial that needs very little maintenance and can be harvested as Chinese medicine. The Folding Paper used by kids after school. It is inspired by the well-known local folk art of paper cutting of this region. 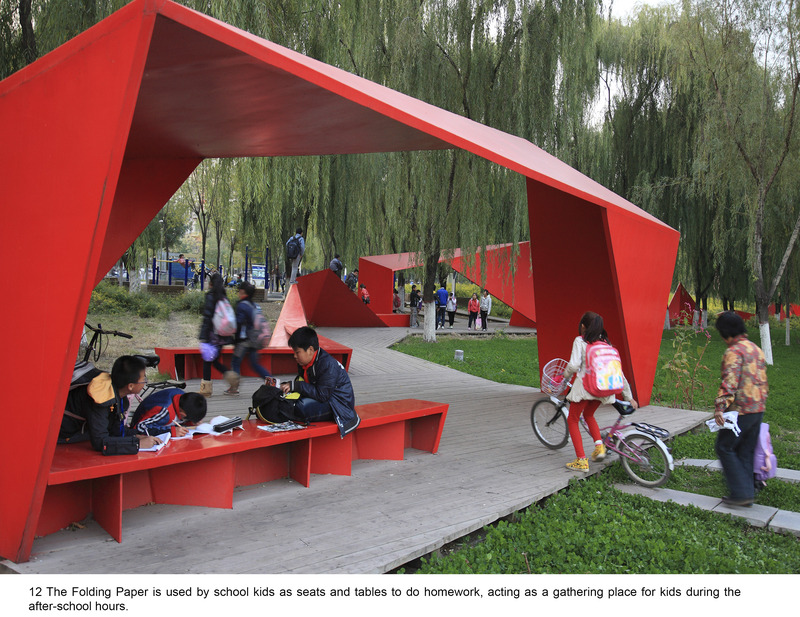 The Folding Paper is used by school kids as seats and tables to do homework, acting as a gathering place for kids during the after-school hours. People enjoy the path-in-the-water as part of their day-to-day experience. Bridges and boardwalks are designed into the river creating access to “tree islands”, which are formed to preserve existing trees on the site. Two young girls wading across the stream, the mother river recovered and the legendary tale narrated by their grandmother now rings true: as a place “where reeds and lotuses flourish and water abundant with fish and soft-shelled turtles”. Existing trees are kept on site through the creation of “tree islands” with stream courses flowing around. 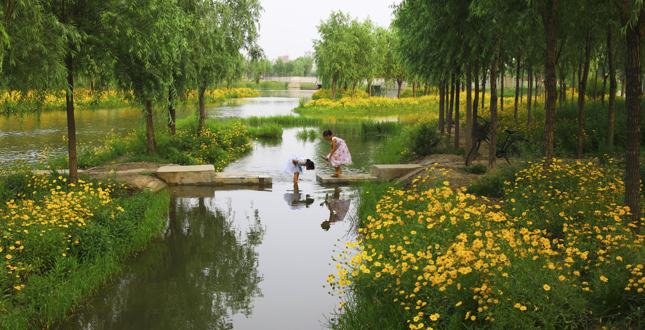 Water platform are built, which enables close contact with nature for local communities. Since its completion, the Greenway immediately became a catalyst for new development. 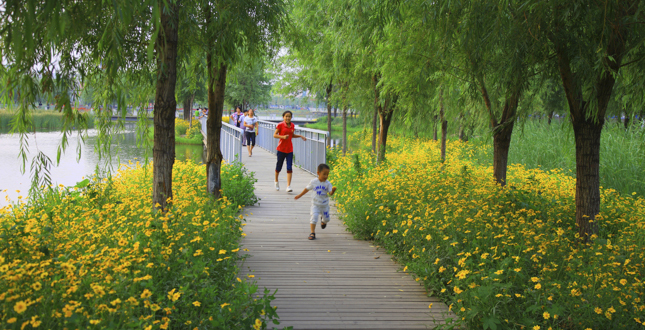 The Qian'an Sanlihe Greenway is transformed from the former garbage dump and sewage drainage. 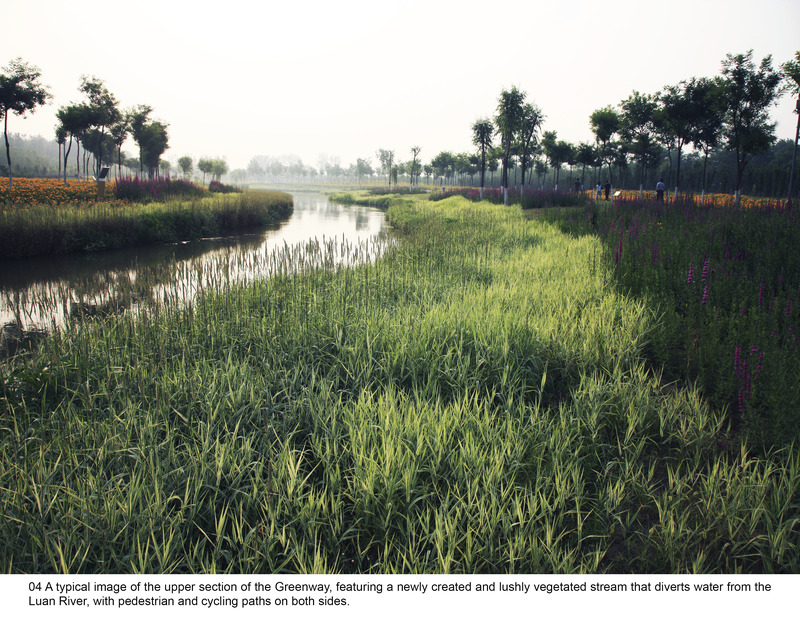 It exemplifies how a neglected landscape can be recovered as an green infrastructure and everyday landscape with restored ecosystem providing multiple services. 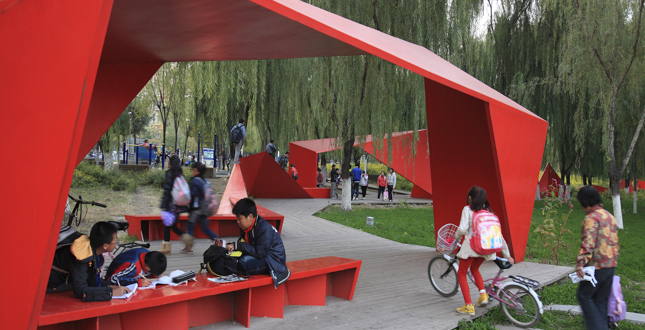 The combined pedestrian and cycle paths for both commuting and recreational use are integrated with art, revitalizing social identity by reflecting local traditions. Through the generation of ecological and aesthetic benefits, the project catalyzes sustainable urban development in the region. 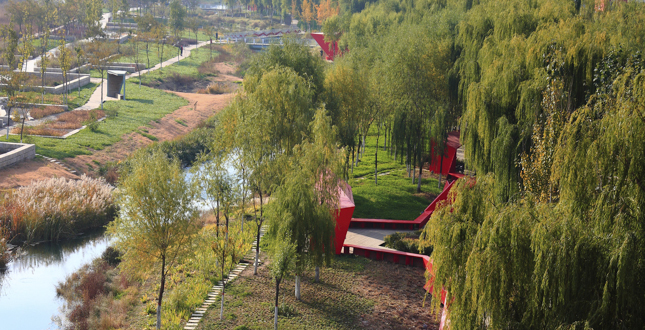 The greenway stretches 13.4 km in length and varies 100-300m in width across the city of Qian'an. It covers 135 hectares and benefits a population of approximately 700,000. Qian'an City is located at the south foot of Yanshan Mountain, at the bank of Luan River, in the northeast of Hebei Province. Although the main city lies near the Luan River to the west, one cannot see the water since the topography of Qian'an is situated below the riverbed with its high embankment blocking the river view. The river is notorious for its unpredictable flooding, and has thus been kept outside of the city for decades through this high embankment. 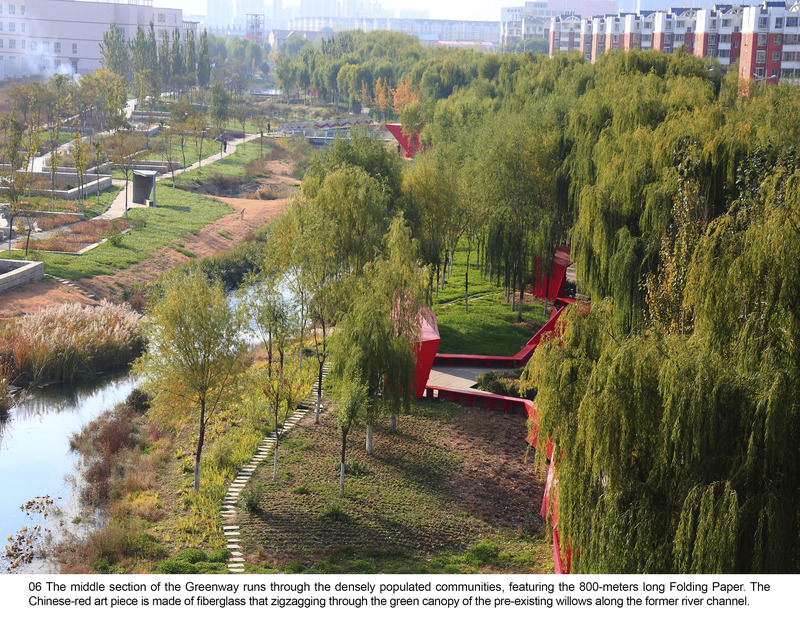 Meanwhile, as the life source of Qian'an, Sanlihe River has shouldered the long history of the city and carried a collective memory of the inhabitants. Before 1973, the Sanlihe River had crystal clear water from the groundwater recharge of Luan River. 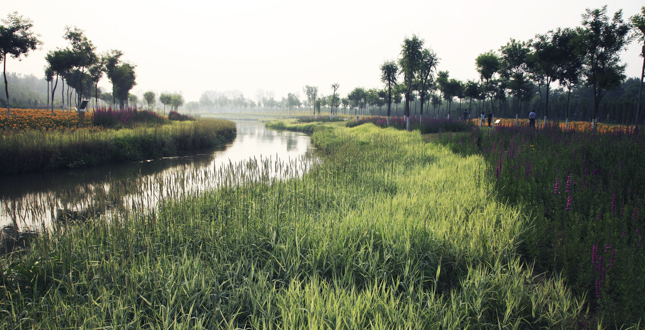 Although frequently hit by storms and heavy rain, Sanlihe River never experienced disasters of drought and flood in its history, which also provides rich water resources for industries and agriculture nearby, as legendary records witness: "reeds flourish, trees shade, and birds inhabit." However, since the 1970s, the river has been badly polluted by sewage and waste, which has resulted from the region's continuous industrial development and urban population growth. 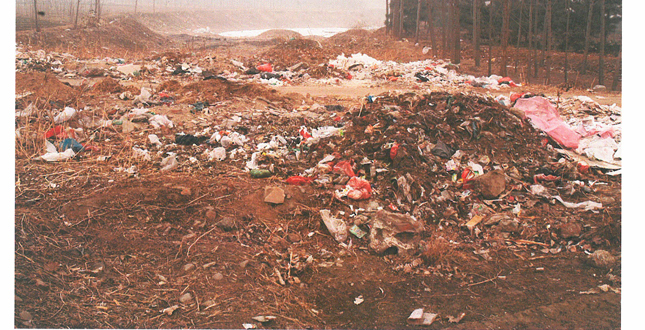 As a consequence, with the depletion of regional water sources, the Sanlihe River became subsequently dried up and its channel was blocked by solid waste. The life source of the city was suffering pains of urbanization, and the hearts and souls of local residents long for its spiritual landscape renaissance. 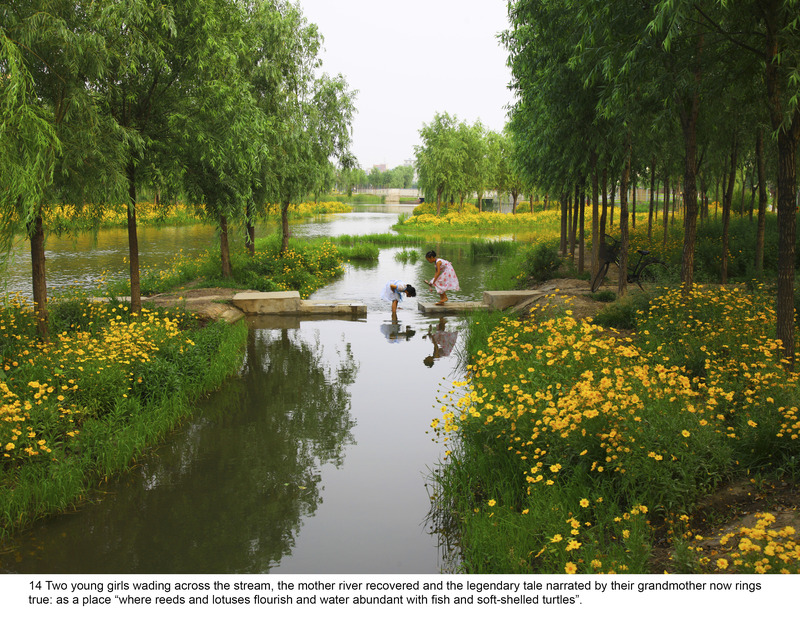 In 2006, the landscape architect was commissioned to recover this mother river. 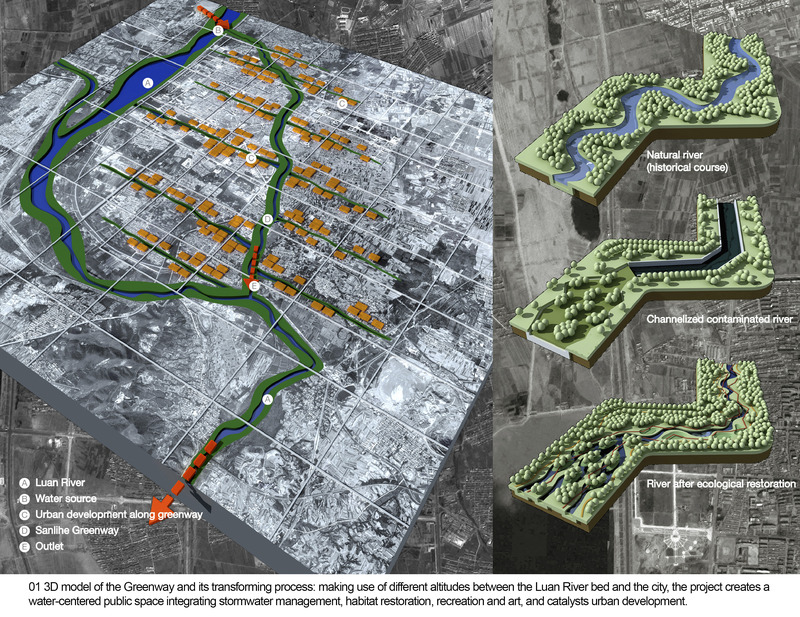 The scope of the task included sewage management (the redesign of sewage pipes that had previously discharged directly into the river with a passive natural infiltration system), as well as ecological restoration and the urban design along the Greenway (although this submission only focuses on the landscape planning and design of the Greenway itself). 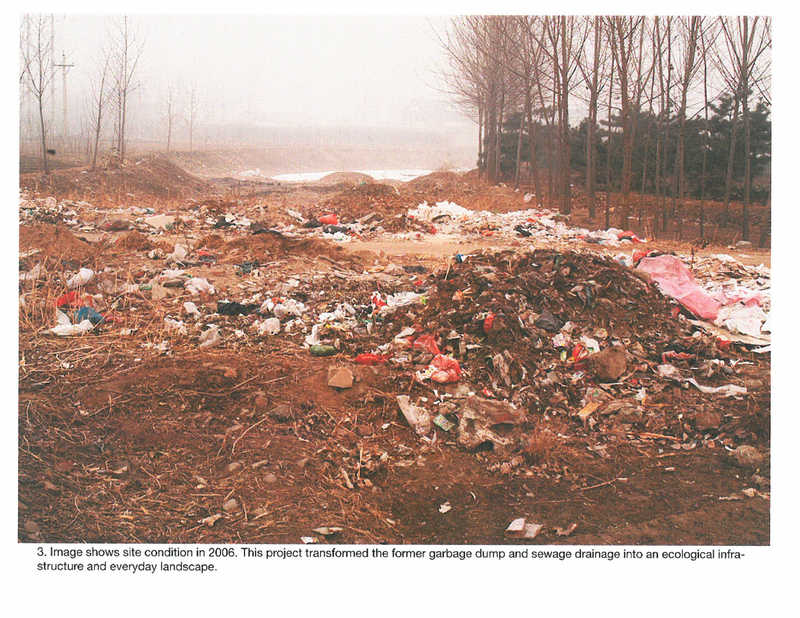 Clean the site: A sewage management system was planned to separate waste water from the urban storm water runoff. As well, organic garbage from the household was used as material to shape landforms, and industrial waste was cleaned up and properly treated. 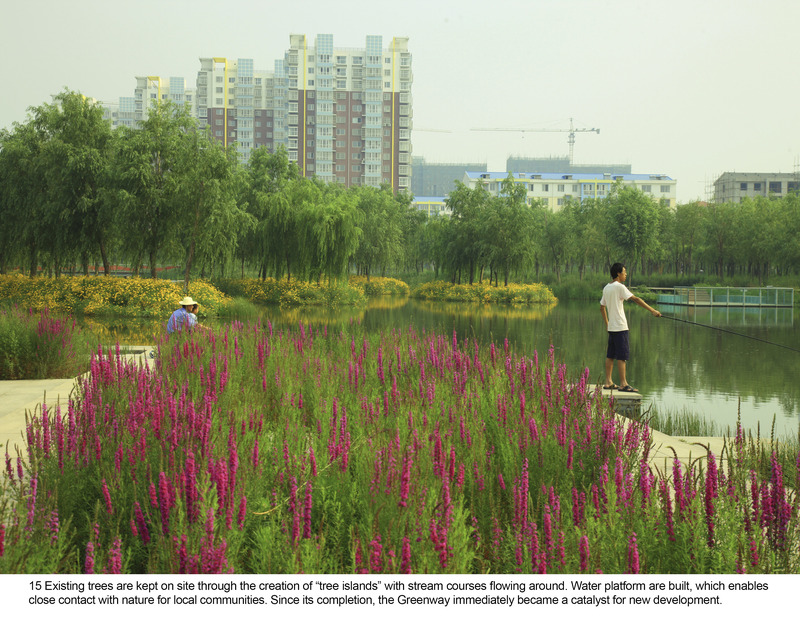 A scenic water byway: the design for the Greenway took full advantage of the existing natural altitude difference between the Luan River bed and the city. A fountain was made through a pipe going under the high embankment, so that a constantly controlled amount of water will make its way through the city before running back to the Luan River at lower reach. This strategy turns the Sanlihe into a “scenic byway” of the larger Luan River and transforms the dangerous natural force into a pleasant amenity. 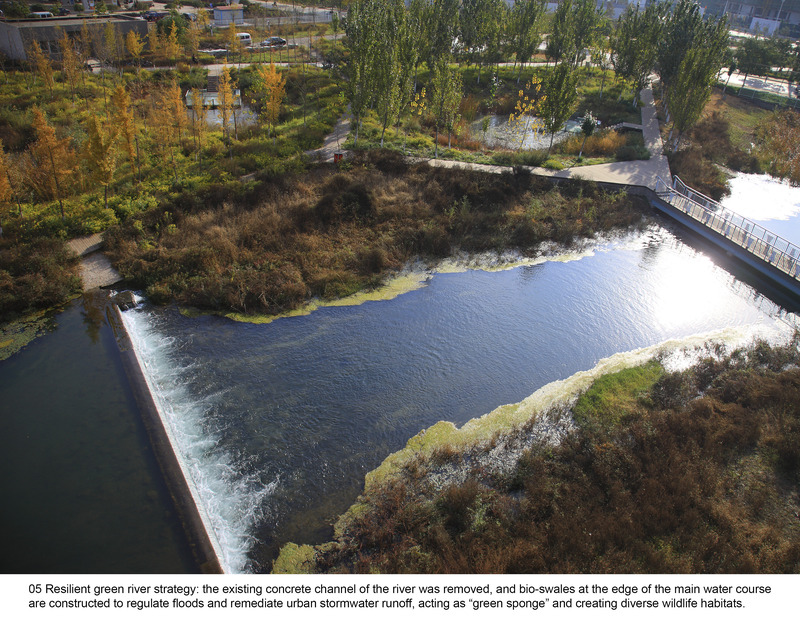 Resilient green river strategy: the existing concrete channel of the river was removed, and a multiple water course riparian wetland system was created (in order to keep the existing tree on site), including the creation of emerald-like wetland bubble chains at the edge of the main water course which regulates floods and collects and dissipates urban storm water runoff. When the river's water level drops to its lowest point, pools of water remain in the emeralds as wetlands, creating a “Green River”. 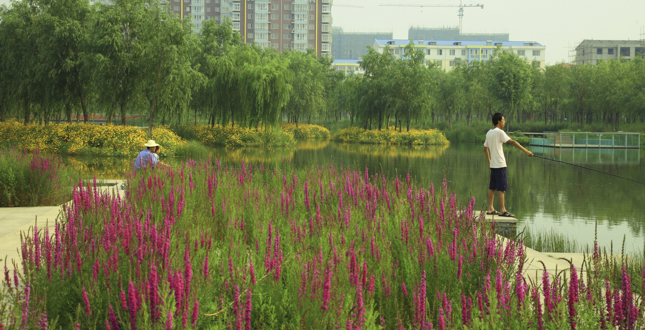 Furthermore, these wetlands work as an ecological purification buffer for urban storm water runoff from both sides. These meandering natural waterways, at various surface levels, becomes diverse habitats for wildlife. Minimum intervention and tree islands: The existing trees on the site were saved and the riverbanks were transformed into a number of tree islands connected by boardwalks, creating a unique setting for daily activities of the residents nearby. By preserving all the exiting matured trees, the Greenway comes into shape immediately after the construction, while minimize the construction cost. Pedestrian and cycling paths: Along the Greenway are the pedestrian and cycling routes fully accessible to communities along the channel. Low maintenance: The project used low-maintenance native vegetation, lush wetland species, and self-reproductive wild flowers for the undercover. The resilient green river strategy allows the water table to naturally fluctuate over seasons. The contrast between “messy” nature and the minimum design of the boardwalk and waterfront platforms turns the big greenway project into an artful everyday landscape. 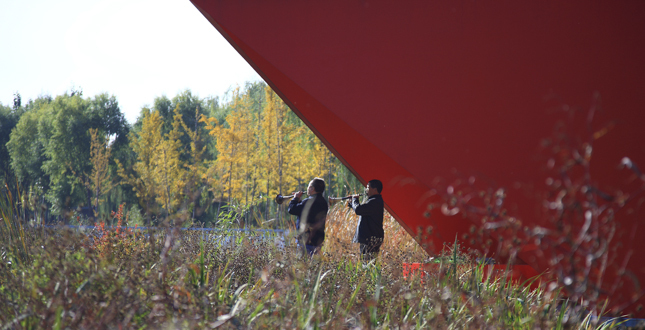 Integration of art: Art is integrated with the ecologically recovered landscape. 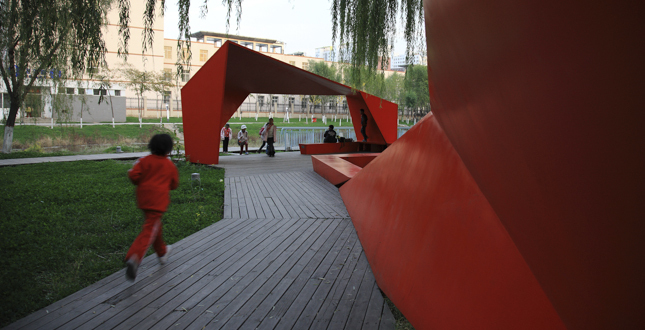 One of the major pieces is an 800-meter long Folding Paper made of fiber glass and in Chinese red, which integrates shelters, seats, boardwalk and lighting. The Folding Paper is inspired by the well-known local folk art of paper cutting. 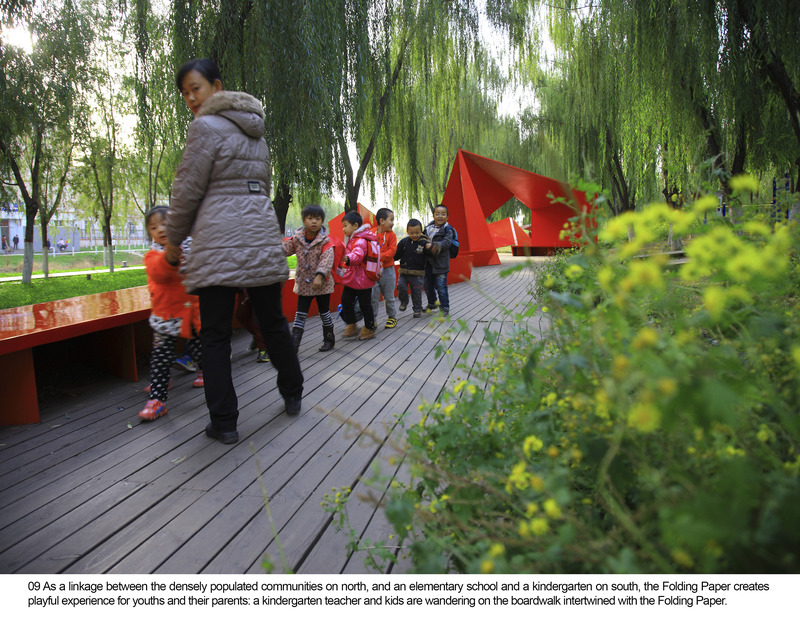 Sitting right on the school route between a densely populated community and city's major elementary schools and kindergartens, this red-colored installation runs through the green canopy of the pre-existing willows, enriches the landscape with planting of “messy” Chinese pennisetum and wild chrysanthemum, and becomes an artful and unforgettable daily experience for kids and their parents. 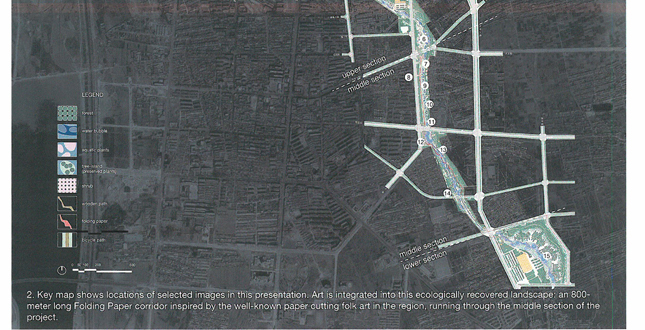 Landscape guides urbanism: The Greenway is used as catalyst for urban development. High density of residential development was envisioned at both sides of the Greenway. Immediately after the Greenway was built, an enormous amount of new housing development investment has been attracted and completely transformed the urban morphology of the city. The Greenway can be characterized into three sections: the upper, the middle and the lower sections. 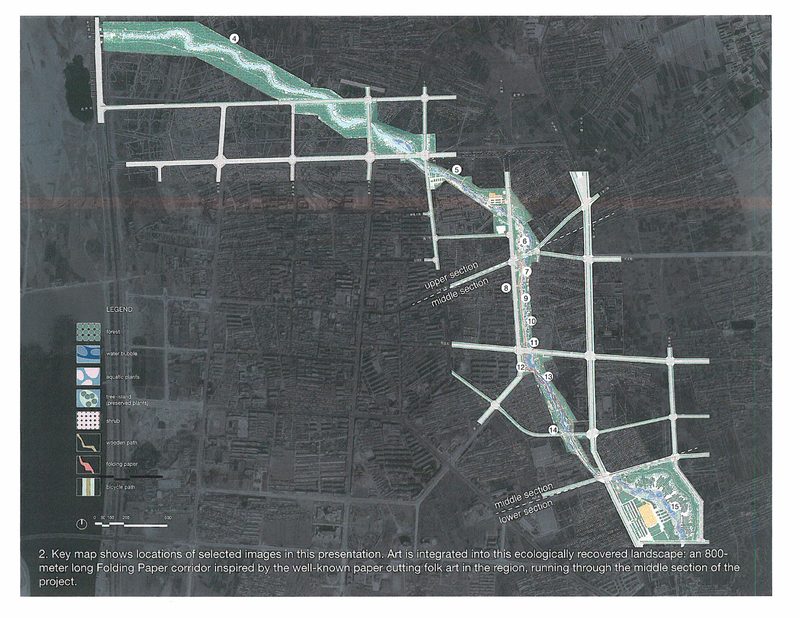 The upper section runs through the city's underdeveloped area and is featured with a newly created stream that diverts water from the Luan River integrated with pedestrian and cycling paths at both sides; The middle section runs through the densely populated communities and is most heavily used by people especially school kids, and the Folding Paper becomes the dominant feature. The concrete in the former river channel was removed, and the old channel was filled with the dirt from the excavation of the new river at the east side. In this way, the trees were saved and their roots on the steep old bank will not be exposed because of the removal of concrete; The lower section is in a less populated area and was most densely forested area, with pre-existing wetlands, where it is more featured with multiple stream courses, tree islands, wetlands and boardwalk networks which run across islands and cycling paths at both sides of the Greenway. 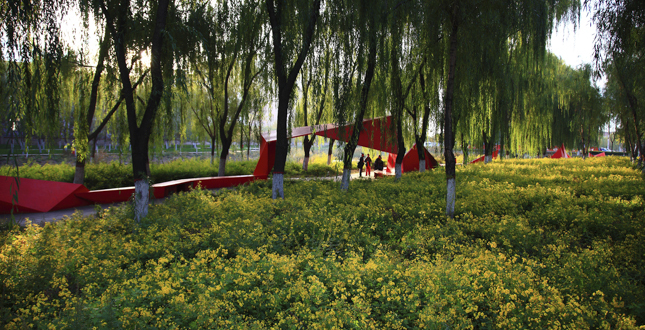 Only over three years' design and construction, this project has transformed this heavily polluted landscape back to its previous splendor as a scenic urban ecological corridor and the legendary tale narrated by the grandmothers rings back true: as a place “where reeds and lotus flourish and water abundant with fish and soft-shelled turtles”. Moreover, the mother river has been artfully recovered by integrating art that give new cultural identity to the city.